Note- Safe to Read! (No Spoiler Alert!) This review does not have the entire story! 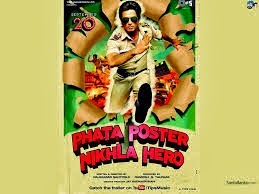 The Story, Screenplay, Dialogues & Direction of the Hindi film- Phata Poster Nikla Hero (PPNH) is by Raj Kumar Santoshi. PPNH’s HERO is Vishwaas Rao (Shahid Kapoor) who dreams to be ‘Filmo Ka Hero’ (Movie-Actor). Vishwaas has set his lofty goal right from his school-days. The grown-up Vishwaas makes his entry to save a damsel-in-distress by literally tearing the poster of Ajab Prem Ki Ghazab Kahaani! He bashes up the baddies like a super-hero and protects the izzat (honor) of the girl! And if you thought all this might be a Ghazab (strange) dream from which our Hero will soon wake up, you are terribly mistaken! Vishwaas is a real-life Hero who dreams to be a reel-life Hero! Unfortunately, his Maa Ka Sapna (Mom’s Dream) comes in between. Even his finest acting and ‘sad news-stories’ can’t deter his Mom’s iron-will. She keeps sending him for Police-recruitment interviews, while he keeps getting rejected! When Vishwaas gets a chance to land up at Mumbai, he meets ‘Complaint Kajal’ (Ileana D’Cruz) who mistakes him for a Police-officer due to his ‘costume’! She makes him follow a car that has kidnapped the Chief-Security Officer (CSO), Bhim Singh Thapa’s daughter. Despite a chance encounter with his idol, Film-Star Salman Khan (as himself in a cameo), nevertheless, Vishwaas manages to free the girl as the goons run away. What follows is a hilarious set of incidents where the fake cop – ‘Bina Brake Ka Bulldozer’ (A Bulldozer without any brakes) manages 'Heroine ke saath romance' (Romances the Heroine) & 'Villains ke saath fight' (Fights the Villains) & earns respect for the Mumbai police force with Jt. Commissioner Khare (Darshan Jariwala) at helm. Mission WhiteElephant* is aborted much to the relief of the audience as it was serious & would have caused widespread destruction. There are fun moments like Commisioner Khare’s scenes with Vishwaas. Imagine his shifting to the same house where Vishwaas is put up! By the way, how could Vishwaas afford such a place on rent?! Another point- Vishwaas being entrusted to pick a CD from a Music-Performance. He gets selected for the job as no one would suspect him as he knows the CSO! When he collects the CD in front of all, including the Police, I thought- CD could have been collected from the Troup from anywhere else- Hotel/Airport…why from Stage?! I guess this was opportunity for the ‘Item-Girl ke saath (Dhating) Dance’ that Vishwaas mentions at the end! There’s never a dull moment in PPNH! There are references to Superhit movies like MunnaBhai MBBS, Don, Deewar etc. There’s comedy when one is least expecting it! Like in the Hospital when Vishwaas’s Mom is admitted and Vishwaas asks, “Vinod Khanna Doctor bhi ban gaye? !’ Santoshi gets his timing right! PPNH is a complete package- Emotions, Drama, Action, Comedy, Romance, Dances, Songs… Songs are a bit too many. But, I didn’t complain as I got to see the two very good-looking stars in good locales! The ‘Maa’ song is really touching and filmed well. The Doggy-dance ‘Khaali Peeli’ song is fun! What I didn’t like- Two references to ‘Zahar’ (Poison)- made by a person ‘acting as a Blind-Man’ & Vishwaas’s Mom. Such a fun movie could have desisted itself from the word. I loved- How at the end, his Maa’s wish is fulfilled as Vishwaas becomes a real-life-hero and explains all that he has done that a reel-life hero does! He even turns down a film-offer with -“Mere Paas Maa Hogi!” (I will have my Mother!) Awesome performances by the cast! The actor to watch out for is- the HERO- Shahid Kapoor. He rocks! Mission WhiteElephant*- My child asked, “But Mamma, if Mission White Elephant is successful, then no one will be saved…not even the Mission’s Planners!” Perhaps the Planners planned to leave the city and get saved! Truth is, no one in this world can be saved from the effect, if any such thing really happens! I'm NOT telling you any more than this!!! Do watch PPNH! Worth the good laughs! So, ready to ‘go bananas’?! Hope I can get time to see this. That's true! Even I wondered the same about the On-Off game! No worries, Preethi! These days they are showing the latest movies within a few months of their release! You should be able to catch it soon on TV! its a movie to watch. I loved it and the girl is so cool muuuaah. Yes, PPNH sure is a fun-watch! :) I loved the movie and both the lead-stars too!